Hello friends! I hope your week is going wonderfully and I am thrilled you made your way to my new Think Fit Blog. 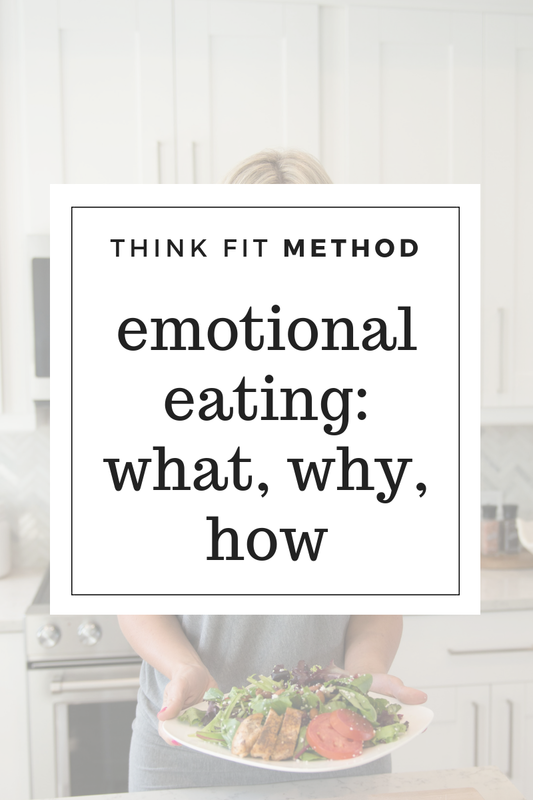 As I’ve worked though many topics around mindset and emotions on the whole, the topic of emotional eating always jumps to the top of people’s list of struggles. It’s likely that you’ve heard this term in passing, but do you fully understand what it is and how it can impact your health? This isn’t just a physical effect but really becomes something we battle as a mindset issue even more. Do you eat when you’re not hungry or even when you’re full? Do you eat to feel better (to calm yourself or when you’re sad, mad, bored, anxious, etc.)? Emotional eating is not uncommon as you would guess after reading some of these indicators. That said, we CAN find freedom from defaulting to our emotions being the dictator of how we fuel our body and keeping our mind in check. -Identify your triggers and work to find ways to steer clear from them if you can. If not, work to consciously choose a new way to calm down or destress that doesn’t involve food/beverage. -Practice “mindful eating” regularly, even when you are not struggling with emotional eating. Develop an awareness of your eating habits, what food makes you feel fueled and full and clear headed. -Find Accountability. Friends, we need this even when we think we don’t. Breaking habits takes support, encouragement and an occasional talking of a ledge from someone who knows and cares about us. Find a friend you can trust to talk to before you let your willpower run out. -Renew Your Mind. God wants us to live fully alive. Mind and body. We have to learn to renew our mind and cast off what is not true and claim what is. To put on the armor and trust that God can change the narrative in our heads from failure to new in him!